Excuse no 2: I can’t open my home because the details stress me out! I love opening my heart and home to others, but sometimes I can let the details of the event overshadow the reason I’m opening my home in the first place. If you’re like me, you’ve probably thought: I can’t open my home because it stresses me out! When my husband and I first embarked on this monthly hospitality journey to strengthen our church plant, we realized we were missing out on some big opportunities to connect with visitors to our church. So, we tossed our plan to host a sit down lunch for 8 (the max my dining room table would hold) and threw open the doors of our home to whomever God brought our way. 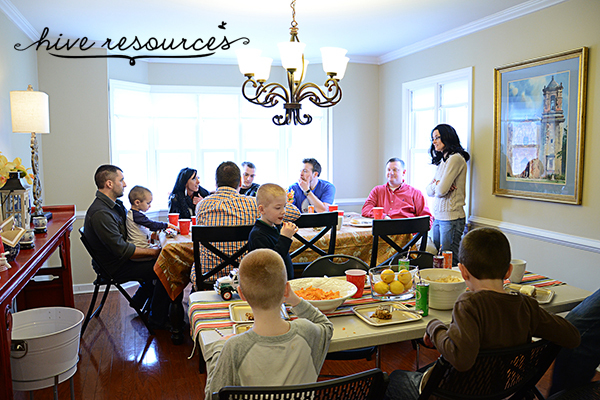 We wanted to welcome any and all guests to our church to a monthly Sunday lunch in our home. I wish I could say I entered into this new plan without fear or reservation. But I’m a worrier by nature, and so I began to have some second thoughts. 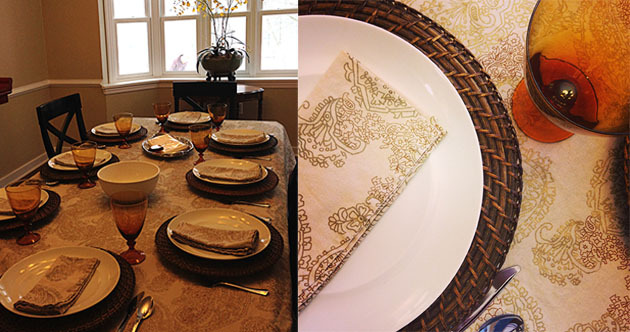 Those tendencies to obsess over the details of seating arrangements and place settings still crouched in the recesses of my mind – only this time they whispered seemingly innocuous little questions. For me, worrying about the details of hospitality is the easy part; trusting God to orchestrate the event for his glory is another thing entirely. But I’ve opened my home enough to learn that over-thinking the details of hospitality can yield some very negative fruit. Stressing about details can leave me cranky toward my family. It can also ensure I’m emotionally and physically spent after my guests leave. Yet, if we are careful to commit our plans to the Lord, we will catch a marvelous glimpse of the God who is Lord over the Details. About halfway through our meal, I surveyed my house. I counted 15 adults and 7 children. We had so many people that I had to turn my dining room table sideways and add another folding table to the room. Small groups of people were talking in corners, around the table, and on the couch. I heard little bits of conversations about faith and life, as I serve more coffee, stepping over children and stuffed animals sprawled on the floor. And while there wasn’t a seat at the table for everyone, everyone had a place. My second hospitality lunch brought me this conclusion: there is beauty in the details of hospitality. But that beauty comes not because of carefully-arranged centerpieces or new tablecloths (big shout out to my mom who bought me a new one in honor of my party though!). Biblical hospitality is beautiful because God’s hand is in the details. His hands guide guests to your door. His hands shape conversations. 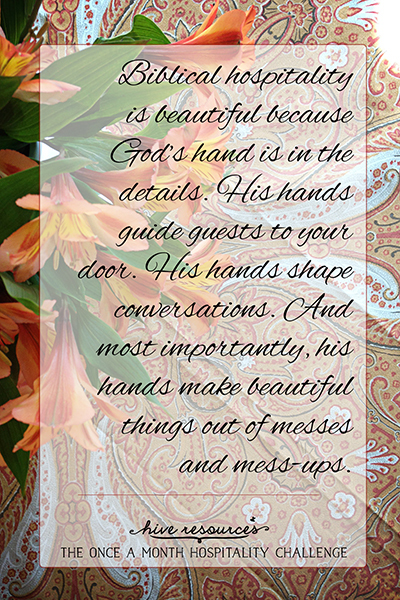 And most importantly, his hands make beautiful things out of messes and mess-ups. So, even though at one point I looked around and both of my kids were missing an essential piece of clothing (one a shirt and the other his pants!!!!! ), I knew that the details of hospitality bore marks of beauty. 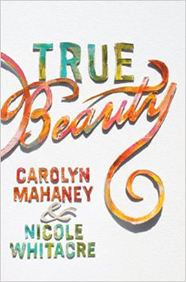 What our earthly eyes can mistake as inconveniences, pressures, or embarrassing moments, the God of Details views as moments of beauty. My home became a safe and comforting place because the God of Comfort was there. – Saving a family from darkness. One of my lunch guests visited our church after making a profession of faith this very week! Over lunch, the couple was able to have some one-on-one time with our pastor to discuss next steps, baptism and more. – Encouraging a family already grounded in the faith. Another family with young boys was able to connect with new, like-minded friends. 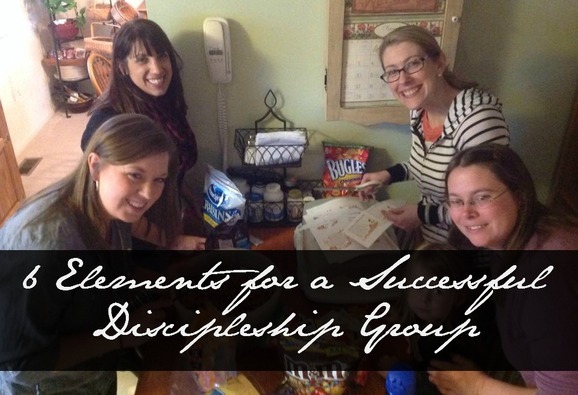 – Allowing new members to utilize their gifts in serving the body of Christ. Some of my lunch guests are still new to our church plant. Yet, they helped serve, bring a dish, and clean up. 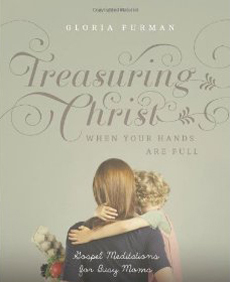 – Proving a safe place for a family seeking out what it means to know God personally. When we set aside the stress of hospitality and offer our homes as places of spiritual renewal, we receive the special blessing of seeing God orchestrate the littlest of details in very big ways. The Spirit was at work in my home and I got to see it and savor it. What a blessing to see him move in the place I love most. Do you avoid opening your home because the details stress you out too much? What do you do to trust the God of the Details? 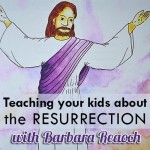 If you hurry, you still have time to enter the giveaway for the Easter Story Eggs & Devotional – a wonderful tool to lead your family closer to our Risen King! 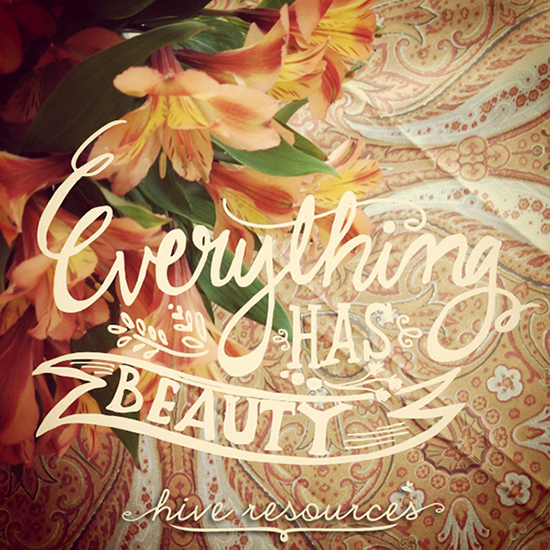 Welcome to Hive Resources. This post is part of my Once A Month Hospitality Challenge – a series to help you intentionally open your heart and home to grow the church. I started my Once a Month Hospitality Challenge with one proviso – I wouldn’t buy anything other than food and paper goods. No new serving platters, table decorations, or cute little hand towels. So, with that rule “settled,” I started planning for the first meal of my hospitality challenge. I planned out the guest list. We invited two couples who were new to our church to join us for lunch immediately following the morning worship service. I planned out the table arrangements. Our lunch crowd numbered 10. But my dining room table only fits eight if we squeeze everyone in and no one minds bumping elbows. The math was troubling; we couldn’t all fit. So, obviously, I came to the only natural conclusion there is when one is faced with limited seating space. I definitely needed a new dining room table! It seemed perfectly logical to me. The little voice inside my head told me so. 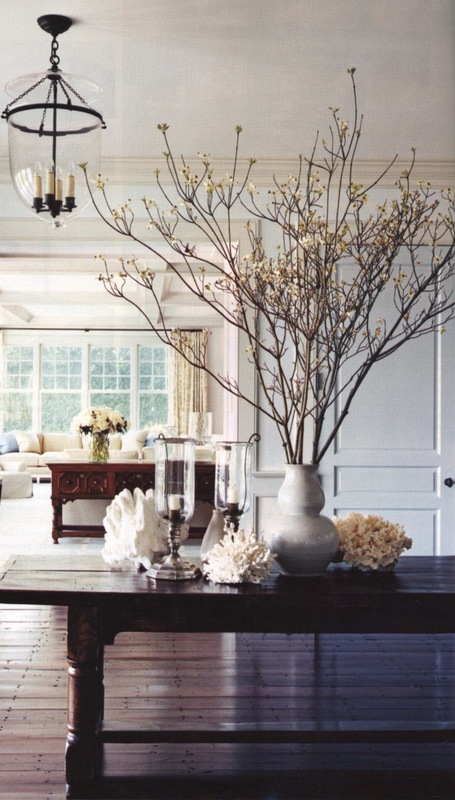 If I had a large farmhouse dining room table, I could serve more people. That little voice also told me benches would be a more practical purchase since my current chairs wouldn’t match the new table. Naturally. …and Pinterest didn’t help either. Wow. That table would seat a lot. And well, that’s just lovely. I mean, think of of all the ministry I could do around that table! By Saturday I was kicking myself for concocting that little no-purchase proviso. And by Sunday, I had worked myself into such a tizzy that I walked into the church service thinking about juggling seats instead of focusing my heart on the One who is already seated in the heavenlies preparing a special table for all his children. I looked around the service, noting all the new faces I saw. What a pity that I couldn’t fit all of them around my teeny, tiny table, I thought to myself. And when my husband mentioned inviting a few more people to our already-full table, I balked. “We don’t have enough room. We’ll have to invite them next time,” I told my husband, needlessly reminding him that we’re doing this thing once a month. On the way out of the service, we discovered one couple wasn’t able to attend lunch. We looked around, quickly discovering we had missed our opportunity to invite the visitors we had spotted earlier. And while it certainly solved my seating dilemma, it also gave my heart a jolt in the right direction. I realized I had allowed that little runaway voice in my head who was screaming “YOU DON’T HAVE ENOUGH SPACE!” to silence the soft murmurings of the Holy Spirit. I had missed a crucial opportunity to connect with people God had placed in my path. I had planned a large and lovely meal but hadn’t invited enough guests to the table. 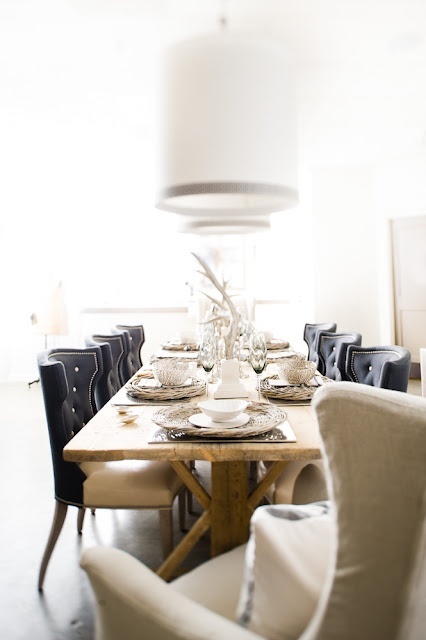 By the time we were driving home from church, I knew this Once a Month Hospitality Challenge needed to be bigger, and buying a new dining room table wasn’t the answer. 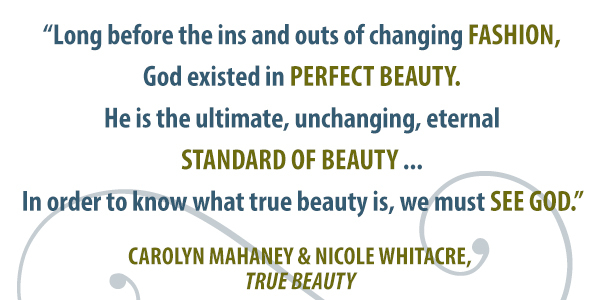 I needed to open my heart wider by closing the door on perfectionism. My heart wanted a perfectly laid out table with matching linens. My heart wanted porcelain place settings and coordinating stemware. My heart wanted these things because they made a perfect picture. 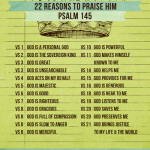 But at it’s root, perfectionism commends only itself instead of the greatness of the God we serve. 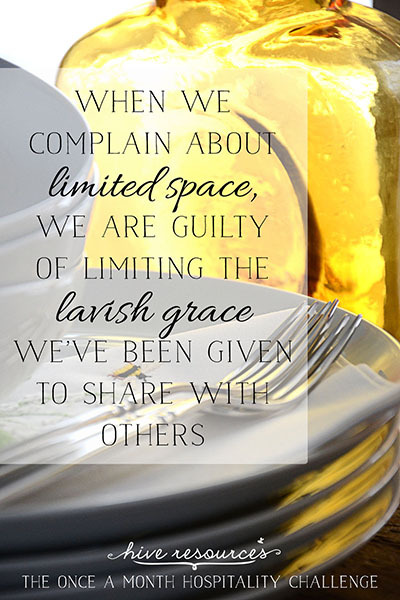 So, when we complain about limited space with respect to hospitality, we are guilty of limiting the lavish grace we’ve been given to share with others. Step 1: Throw away the table settings and embrace paper plates balanced on knees. Step 2: Throw away family-style dinners and welcome self-serve buffet lines winding through our kitchen around the dining room table. My Once a Month Hospitality Challenge is now an invitation to an open-house style lunch. We want to get as many visitors to our church through our front door. That sounds like a big undertaking. Even as I write it, I’m scared. It will require planning meals that will stretch. It will require communicating the lunch opportunity before and after the worship service (which means getting the whole family to church on time!) 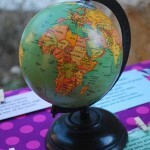 It will require having an invitation ready to hand out with our address and driving directions. But most of all, it will require letting go of perfectionism – and the personal pride it represents – and embracing the people God puts in our path. No house will ever have enough entertaining space. No dining room table will have enough seats. 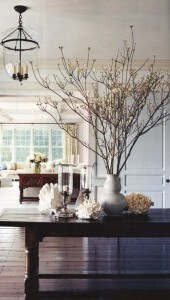 There is no perfect home; what makes a home useful is the Spirit who indwells it. And no matter what that little voice whispers into my ear, I don’t ever want to fall for the same trap of limiting grace under the guise of limited space. Are you a sucker for the limited space trap? What holds you back from opening your home? Share your thoughts about hospitality in the comments! Thanks for joining me on this hospitality journey. I hope you’ll stick around to share in some of the lessons God teaches me along the way. 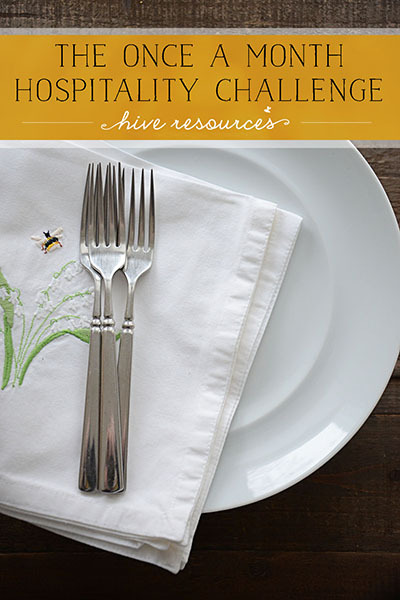 Subscribe to Hive Resources here. I’m linking up with Thought-Provoking Thursday. Starting this month, I’m giving myself a challenge – a challenge that I hope the Spirit will use to grow me in Christ-likeness and grow Christ’s church at the same time. I’m calling it the Once a Month Hospitality Challenge: Intentionally opening heart and home to grow the church. Once a month for the next four months, my family and I will host lunch immediately following the Sunday morning worship service for visitors to our church. To be intentional about fulfilling the biblical command to practice hospitality. To be intentional about building relationships. To be intentional about growing our church. 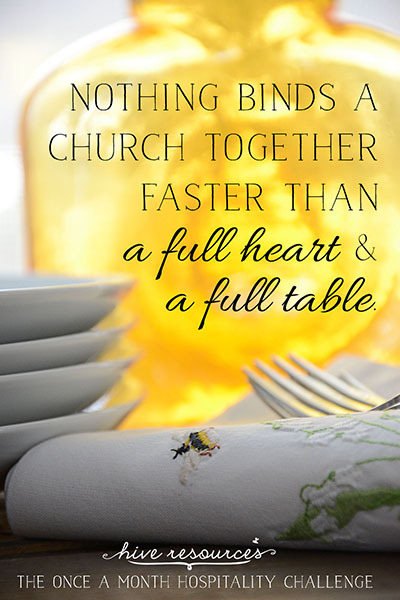 Nothing binds a church together faster than a full heart and a full table. It’s what the Spirit does: he fills us up and fixes us together so we’re a testimony of his grace. For those reasons, we’ve found that hospitality has been a huge factor in my family’s own church planting journey. On a pre-selected date, my plan is to have a meal ready to go when I leave for church in the morning. But because I can’t do this alone, I asked another church family to partner with us. This family has a heart for building relationships and entertaining, so I’m very excited to serve with them. Plus, they are some of our very favoritest (new word!) people in whole wide world. The guests? For the most part, we’ll leave that up to God. Sometimes, the invite list will depend on who shows up for church that morning. I want to be ready for any opportunities to connect. But I particularly want to reach out to new members and recurring guests who haven’t assimilated into church life yet. Those invites will happen in advance. Next, we’ll invite church family members who need encouragement and any other guests God brings our way. It’s sure to be difficult. I’ll probably be waiting for the pastor to say “Amen” in his closing prayer much like a track runner poised at the starting line of a race track. And then I’ll frantically make a mad dash to the house to get dinner on the table before our guests arrive. It’s sure to be inconvenient. There’ll probably be cancellations, schedule changes, sickness, and more. It’s sure to be messy. My five-year-old twinadoes will make sure of that! But that’s what life is! I don’t pretend to imagine that opening both heart and home to friends and strangers alike would be anything other than that – messy! But, I know it will be really fun. And, above all, it should be exhilarating to see how God fills us with his love so that we can pour it out for others. Oh, and here’s the kicker. To up the ante, I’m going to try to meet this challenge without buying anything new! No cute plates, no new serving dishes, no sweet little hand towels for the guest bath. It’s not that those things are unnecessary, it’s just I know myself. I can turn any chance to open my home into a party, and I’d rather spend time preparing myself to open my heart instead. All the “stuff of entertaining” can easily become a distraction for me and before I know it, I’ve taken my eyes off the Person who helps me love the people in front of me and focused them on pretty things instead. So, I’m budgeting for food and paper goods. That’s all. Think I can do it? I’m a little unsure. 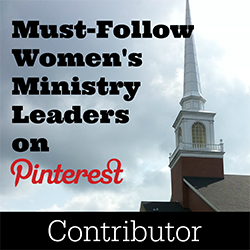 But I hope you’ll follow along, because I sure could use your encouragement! I’ll be posting about our meals (the dishes that made the grade and those that flopped – because there are sure to be a few of those! 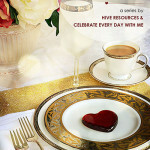 ), the lessons we learn along the way, and how God orchestrates the meal and the company for his glory. Full heart. Full table. Once a Month Hospitality Challenge. Join in! 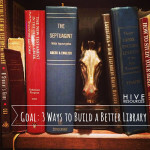 Subscribe to Hive Resources so you don’t miss any of this series. 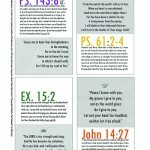 While you’re here, be sure to enter the giveaway for the illustrated Bible memory set of Ps. 91 by Heart Binder Innovations! Contest ends tomorrow! I’m linking up with Thought-Provoking Thursday. 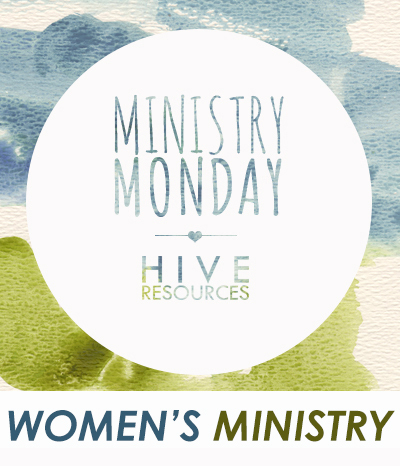 Welcome to Ministry Monday. Today’s post is part of a series called Simple Service – easy ideas for taking care of your church family one act of kindness at a time. Take my Simple Service Challenge this month and post your pics to Facebook & Instagram with #simpleservice! There’s one cardinal rule of motherhood. Thankfully, I’ve only broken it a few times in the last 5 years. The rule? Moms can’t get sick. It’s a fact. Like your toddler wetting the sheets you just changed or the dishwasher breaking when your husband goes out of town. It was more of an epiphany than a complaint. She had just discovered cardinal rule #1. Moms simply can’t get sick. And by that I mean, they aren’t allowed to get sick. Oh, sure Moms get sick all the time. No matter how many times you wash your hands, you live with miniature walking germ factories. It’s just that finding time to rest between laundry, work, household chores, ninja fights in the playroom, chauffeur duty, and dinner prep is really hard. Almost impossible if her house includes infants. When my husband and I moved across country and away from family, the depressing reality of said rule became even clearer when our whole house came down the stomach flu – yep, including momma. Taking pity on me, my pastor’s wife braved the virus and knocked on our door. When I answered (looking like the Grim Reaper, I’m sure), I saw she had a large pot in her hands. She brought me homemade chicken soup. Her gift was a healing balm for my soul. And recently, she brought me a steaming pot of soup when I had a nasty cold. It was as good as I remembered. Last week, one of my friends posted a picture of a container of soup someone had brought her when she got sick. Taking a sick mom homemade soup is a small act of kindness with a huge impact. Caring for our church family when one of us “takes a hit” from life is an easy way we can stir up love in the body of Christ. Are you inspired to stir up love? Here’s my pastor’s wife’s recipe! In a pot, bring broth to a boil and add orzo (cook according to package directions). Lower heat and add spices and chicken. Once heated through, remove from heat and add spinach. Serve with grated Parmesan cheese. To serve more, you can easily double the ingredients. So, stir some love up today! 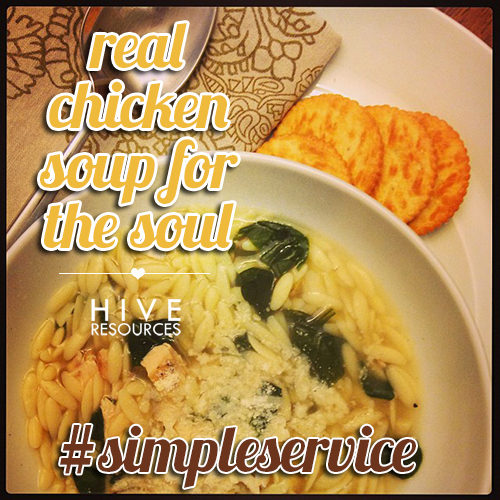 Take the Simple Service Challenge and bless a struggling mom or a sick church member with some homemade healing soup! Have a good recipe? Share it in the comments! 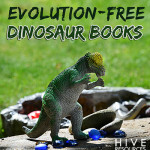 I’m linking up with Recommendation Saturday. I’ve done it, but it’s never happened to ME before! And the feeling was very humbling. I’ve bought other people drinks through the drive-thru as an act of kindness or to “pay it forward” as the popular motto goes. One Mother’s Day, I bought coffee for a mom and daughter in the car behind me at Starbucks. I drove away, imaging their faces when they pulled up to the window and were told they had just scored two free drinks. But I never imagined how they felt. Not until last week, when I pulled up to the drive-thru window and the cashier told me my coffee had been paid for. “You don’t owe anything,” she said, smiling. I don’t know the individual who paid my bill. Chances are, if they knew me they wouldn’t have paid it. Because had my windows been down, they would have heard me yelling at my kids to be quiet so I could place my order. But I think that’s the point. Christ pays our debts, which in all fairness cannot be compared to a paltry bill for a cup of coffee. But knowing the true state of our hearts, he pays the debt we owe because of sin all the same. We don’t contribute anything to our redemption. There’s no scraping up spare change from the car console. There’s no gift cards or special points to redeem. “Because of the great love with which he loved us,” Christ settles our debt. And we are free – free to live, free to serve, free to love as he intended. So, if you are taking the Simple Service Challenge this month, stir up love among your church family with this simple act: buy them a cup of coffee. Think about your church family. 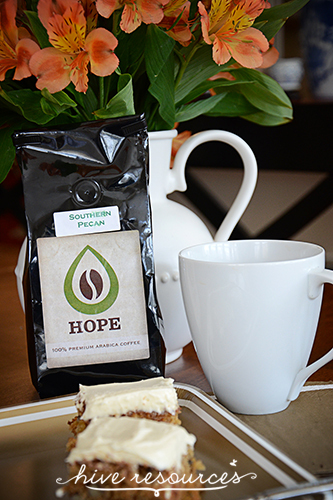 Do you know of a frazzled mom, weary staff member, or a faithful servant that would enjoy a mid-week caffeinated pick-me-up? Write them note and include a small gift card enough for one cup of joe. In your note, be sure to tell them how thankful you are for them and how they’ve blessed you. Assure them of your prayers. (This happened to my pastor’s wife, and she told me it was the simplest, but biggest blessing). Imagine how encouraging such a small act can be to someone who is struggling, sick, or has just had a terrible day. In fact, the day someone paid my bill in the Starbucks drive-thru, I was attempting to serve the very same sweet friend who once surprised me with a cup of coffee. I wanted to ‘repay’ her sweet kindness by delivering a cup of coffee to her front door. I couldn’t help but laugh at the irony. There are just some acts of service that can never be repaid. As a friend told me: the Lord blesses with grace upon grace. So, stir some love up today! Take the Simple Service Challenge and bless someone in your church family with a cup of coffee! 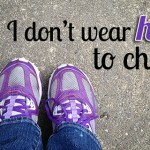 I’m linking up with Renewed Daily. 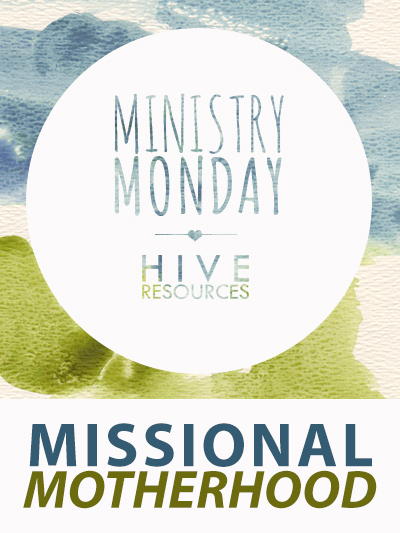 Welcome to Ministry Monday. Today’s post is the first in series called Simple Service – easy ideas for taking care of your church family one act of kindness at a time. Take my Simple Service Challenge this month and post your pics to Facebook & Instagram with the #simpleservice hashtag! Hey, Mom! When you hear your pastor’s call to missional living, don’t be so fast to count yourself out! 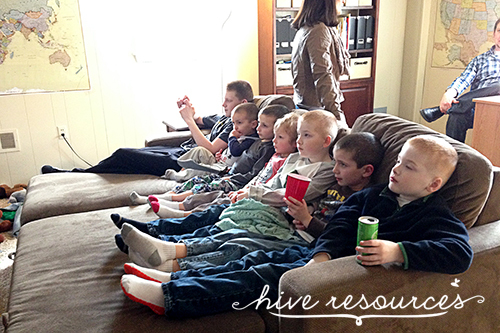 Yes, having kids in tow can make participating in ministry outreach events difficult. I’m probably not the only mother who’s wondered how she can ensure the kids won’t run into the street while she’s operating the spin art machine or painting faces at the fall festival. Typically my husband and I tag-team special missions events hosted by our church because one pair of eyes always needs to be trained on our five-year-old “twin-adoes.” (Trust me. It’s a safety precaution for everyone involved). Or sometimes, as a mom, I’m self-relegated to the home-front so the hubsters can do the heavy lifting that often comes with church planting. But just because mothers can’t always be front and center for church service, doesn’t mean we can’t be missional right where we are. Some of the biggest and most appreciated acts of service that I’ve ever been on the receiving end of haven’t even occurred within the church walls. They’ve come in the form of homemade bread, hearty spaghetti sauce, and warm chocolate chip cookies made by precious hands after the birth of the twins. They’ve come in the form of a delicious meal lovingly delivered the week we moved into a new home. Friends from my church in San Antonio delivered meals to us for weeks after the twins were born! Our church wasn’t large, and I’m sure the sacrifice was great to do so. When we moved into our new home in Pittsburgh, friends from our new church surprised us with a coconut chicken dish that I still dream about – and stayed to enjoy it with us! It was such a blessing! Service can be simple. In a day of takeout and dining out, sharing a meal with a family in need or under pressure can be a profound statement of God’s love. That means moms can make a difference and be ‘on mission’ right from their home. These small acts of service have a big impact on others by filling a critical need – caring for our brothers and sisters in Christ. So, Mom, the next time you think you’re relegated to the kiddie pool while everyone else is diving into the real work of ministry, put on your missional eyes and consider this simple way you can serve your church. This weekend, I heard a church friend was moving. 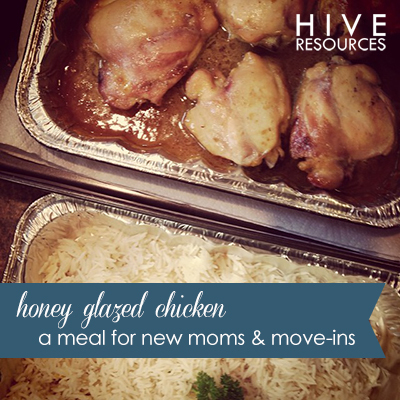 So, I prepped and delivered my standard new mom/new move meal: honey glazed chicken thighs, rice, salad and dessert. It’s easy, tried and true, and makes a bunch! You can find the original recipe below from the freezer cookbook team Susie Martinez and Vanda Howell who wrote their series, Don’t Panic – Dinner’s in the Freezer. STEP 1: Combine honey, butter, mustard, curry powder and salt in medium saucepan. Cook, stirring over medium heat until all the ingredients dissovle into a smooth sauce, about 3 min. Cool sauce and set aside. STEP 2: While sauce is cooling, rinse and divide chicken evenly among freezer bags. Divide cooled sauce evenly over the chicken. Seal and freeze. TO COOK: thaw one entree in refrigerator just long enough to remove from the freezer bag with sauce. Preheat the oven to 350. Place frozen chicken in an ungreased baking dish. Bake for 45 min. Remove dish from oven and separate ck pieces into a single layer, placing pieces meaty side down to keep moist. Bake 1.5 hours. If I’m only feeding a few, I half the recipe and cook immediately without freezing the portions. I cook for 45 minutes with pieces face down in the pan. Then I flip the meat right side up, so the tops get brown and crispy (typically for another 15 minutes or more until finished cooking). To help with browning you can always broil the tops for a few minutes at the end. But watch carefully so they don’t burn! Taking a meal to a church family member is a simple way to serve them. It can also be a great way to reach out to new neighbors in your community! Want to take the Simple Service Challenge with me? Here are my recipes in case you want to try it! Or use one of your own tried and true missional meals. 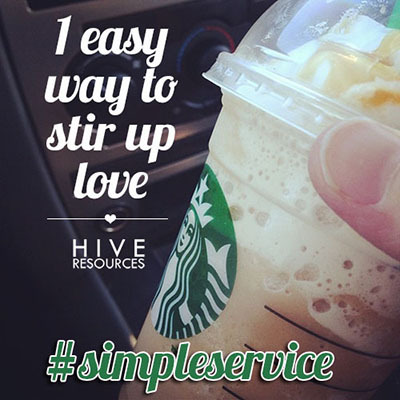 Take a pic when you do and share it on Facebook or instagram with the hashtag: #simpleservice! Have you been blessed by a missional meal? Share your story in the comments and I just might feature you in this series! 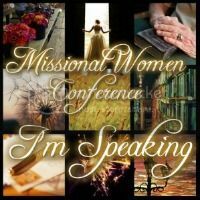 Today I’m guest posting at one of my favorite sites that helps strengthen a woman’s walk with Christ – Desiring Virtue. And I’m sharing on one of my favorite topics – hospitality – as a part of their series Lessons from our Tables – Kingdom Women Sharing Their Experiences with Food and Hospitality. The last few years I’ve been on a journey learning the importance of opening my home and heart as a way to flesh out discipleship in the life of the local church. 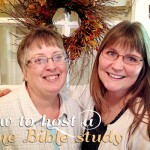 I began talking about that journey with fellow blogger Kristen of Celebrate Every Day with Me in our series Hospitable Hearts. And I’m thrilled to continue it over at DV today, sharing how hospitality and mentoring can easily fit together. 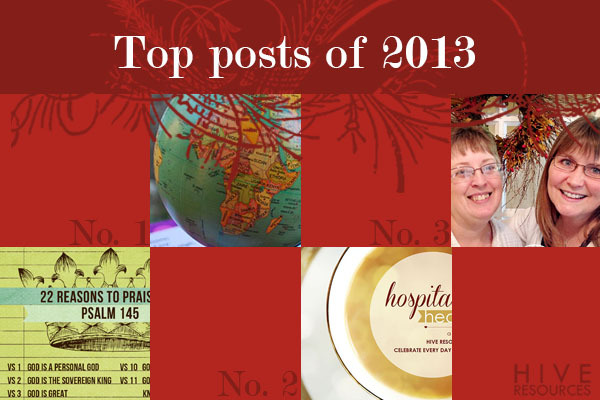 In my post, I offer you four practical ideas for turning hospitality into a mentoring ministry! Plus, I’m sharing one of my no-fail recipes that feeds an army!